Apparently the northern lights should be visible over Iceland soon, shall we run away together? At the weekend my uncle who is a pilot told me he sometimes sees the lights from the sky! He also sails and gets to see the stars on a clear night with no light pollution! So pretty! I'd love to see them someday. Every time they are supposed to be visible wherever I'm living, it's ALWAYS cloudy. It happened when I lived in WA and now in MA. I saw them only twice in my life - when I was a kid and it was just a bright white light in the northern sky and one tiny sliver of green/purple when I was in college in Maine. I hope to see them for real someday! I would sooooo love to see this in person! What lovely colors! I too would love to look up into the sky to see them. This is one thing I would definitely like to see before I die! Oh, wow! I saw the Northern Lights when I was three, I think, but I don't really remember it. I'd love to see them again. That's so cool! & Oh, I would like to run away with you. 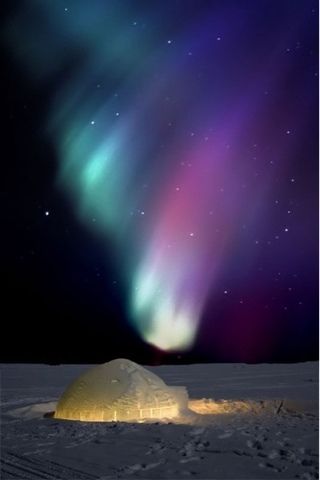 I think the Northern Lights needs to be added to my bucket list!!! Have a great weekend!